Maybe it’s my imagination but I’m sure that in the last few weeks I’ve seen and heard more parakeets about than ever. It feels like West Ealing used to be at the edges of their empire and now we’re well and truly being colonised. I’ve seen and heard them for some years but never have I seen them in our pear tree on Northfields allotments. Now I have and you can bet that they will have chomped their way through the pears at the top of the tree. Also, in the last couple of weeks, the WEN Abundance volunteers have been picking apples off local trees and, again, the half eaten fruit off the high branches is a sure sign of parakeets. I don’t think there’s anything we can do to deter them from eating the fruit. I’ll just have to hope they leave enough for us earth-bound humans. Advice Plus is a new ‘drop in’ advice service open to residents who live in Ealing and more specifically in the West Ealing area. • Money advice on debts, benefits and managing finances. • How to switch energy provider and save money on your monthly bills. • Health and wellbeing- tips on how to live a healthier lifestyle including support on mental health. Our next session is on the 1st October between 1-4pm and is at Green Man Lane Café. Walpole and Elthorne Safer Neighbourhoods Teams have launched a new initiative combatting alcohol related antisocial behaviour and street crime called OPERATION BOTTLETOP. The operation will see officers tackling these issues through targeting hotspots such as Dean Gardens and areas surrounding West Ealing Broadway having listened to the concerns of West Ealing residents and hearing the detrimental impact these issues have been having on the local community. The teams have already made significant progress on the initiative. Over the weekend of September 19th and 20th, officers from the Walpole SNT arrested two men for racially aggravated public order offences who had been drinking heavily in the Dean Gardens. Elthorne SNT officers arrested one man for affray following an alcohol fuelled fight on Uxbridge Road in the early hours of Friday morning and one man for begging, who was found to be in possession of more than £250 in cash. Two men were given cannabis warnings. There will be a strong drive for officers to enforce controlled drinking zone dispersal powers and alcohol confiscations. By the end of the weekend 26 alcohol confiscations have taken place from people drinking in the streets. Police officers will be joined by outreach workers from RISE, Ealing Council’s commissioned drug and alcohol intervention service. 462 litres of non duty paid beer and lager was seized from three premises in the West Ealing Broadway area on September 22nd after officers from the Met Police’s Licensing Team conducted a planned series of visits to off-licenses. Licenced premises found to be trading in an irresponsible manner risk having their premises licences revoked by a licensing authority sub-committee. The operation will initially run from the 18th September through to December and will then be reviewed to consider extending the initiative. This follows a successful campaign by Safer Neighbourhoods Teams in Greenford, Northolt and Perivale, which saw a significant reduction in levels of street drinking and associated street crime. Officers would like your support by reporting any street drinkers congregating and causing any Anti Social Behaviour to the Safer Neighbourhoods Team by email at Walpole.SNT@met.police.uk, titling your email Operation Bottletop. 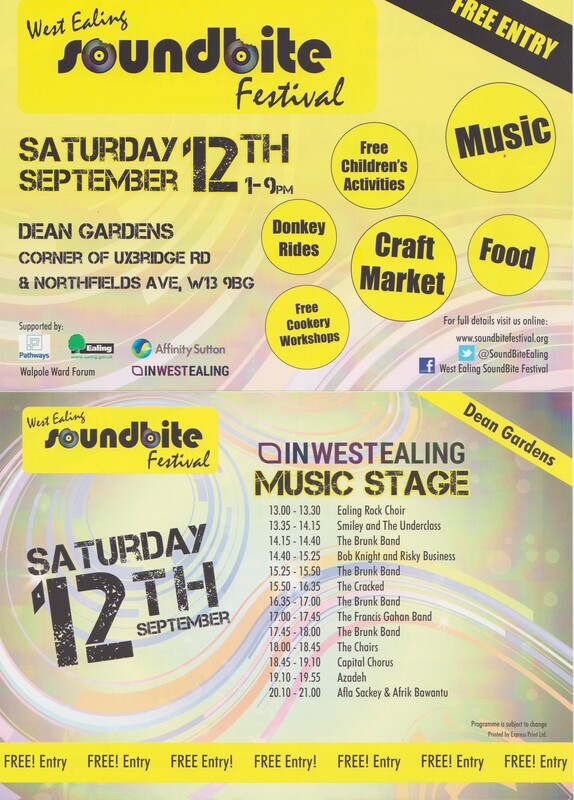 Saturday 12th September sees the third West Ealing SoundBite Festival take place in Dean Gardens from 1-9pm. There will be a music stage, children’s activities, craft fair, community stalls, cookery zone and food stalls from local restaurants. 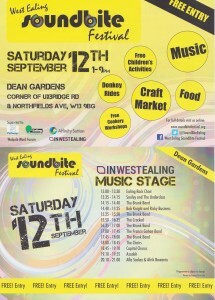 The day opens with the hugely popular Ealing Rock Choir on stage and in the park at 1pm. In the evening we welcome back Azadeh, the singer songwriter based in Ealing who worked recently with Jools Holland and will support Deacon Blue on their forthcoming tour. Cookery demonstrations, pedal-powered smoothie maker,a range of locally-made craft goods, apple juice, ctutneys, honey amd much more. 2015 is the third year that SoundBite Festival has been run and it gets bigger and better each year – we hope to see you there!